Handtücher für das Haus werden zur Verfügung gestellt, die Gäste werden jedoch gebeten, Ihre eigenen Tücher für den Strand mitzubringen. Auch ein Kinderbett ist verfügbar. Der Kühlschrank ist mit einer Eismaschine ausgestattet. Exzellente audio-visuelle Ausstattung. Da es keinen Satellitenanschluss gibt, kann Sky-News nur vorübergehend empfangen werden. Alle Fußballspiele werden im 365 Meter entfernten Pub übertragen. DVD-Player und Video- und DVD-Sammlung. 400 Meter entfernt, befindet sich eine Videothek (Videos: 1 £ für 2 Tage). Die Gäste werden gebeten, das Anwesen bis 10:00 Uhr vormittags am Tag der Abreise zu räumen. Great view of the bay, 5 minute's walk to the beach, bars and restraunts. Great view of the bay from the patio and pool area at the front of the villa. Five minutes’ walk to the beach, bars and restaurants and a short drive up the hill to the charming Pissouri village. Half an hour or so to Pafos and Limassol. Well equipped kitchen with dishwasher, washing machine and fridge freezer. Rooms had aircon on timers and fans. Table, chairs, loungers and umbrellas available on the patio. The pool was great have to cool off in the day. In a cul-de-sac so minimal passing traffic. A great location within 10 minutes’ drive of the highway for easy access to the rest of the island. Very good communications with Angela…. Couldn’t fault it!… We had a great stay… many thanks. Thank you so much for your great review . The villa was perfect and had everything me and my young family needed. It was also much bigger than expected so suited us, my family and our friends perfectly. We had a brilliant holiday and would definitely return. The beach, restaurants and shops were a short walk away and we also hired a car and visited things further a field. Communication with the owner was seamless. Thank you! Thank you so much Amy for your great review. So glad you enjoyed your holiday. We aim to please !! Beautiful position, lovely views, within walking distance down to the beach but mindful of the steep walk back to villa. Pool highly maintained however some of the pool furniture needs some attention. Accommodation very clean with plenty of towels, cutlery etc. Great to have a dishwasher and washing machine. When we contacted Angela with a query she responded immediately and resolved the issue. It would have been nice to have had a small welcome pack as we arrived late after our flight also if we had not had a small touch with us access to the property would have been difficult. We had a lovely time and would return to Villa Sokai. Thank you very much for your review Barbara . I will most certainly attend to the matters you drew my attention to. We will be out there in two weeks and will get some new sun loungers ready for next year . I should have thought more about your time of arrival and left you a welcome pack .Will make sure I do next time .!! And for others of course. We had a great time at Villa Sokai. From before we booked and through our stay, Angela was always contactable for us. The position of the villa above Pissouri Bay was great, 5 min walk into the Bay, the village is a short drive or €10 taxi ride away. Angela gave us contact details for Loucas and he was able to take us whenever we wanted to go to the village, he would even book restaurants for us. The villa has all the amenities you need, the plumbed in fridge was great, ice and cold water at the press of a button. As another reviewer said, the streaming box was a lifesaver for the teenagers in the group.We enjoyed sitting around watching the House Martins swooping around over the pool in the evening whilst having a glass of wine before walking to the Bay for dinner. There were a couple of minor issues, there are no moveable umbrellas that can be put up over sun loungers which would have been great but saying that I've got the best tan I've ever had, the water heater is really noisy but can be switched off and the air conditioner is on a two hour timer, we were waking up several times a night to put the air conditioner back on, I've been told that this is pretty standard practice in holiday homes by an air con man. I would however recommend Angela's villa and if I were to return to Pissouri, I wouldn't hesitate to stay there again. 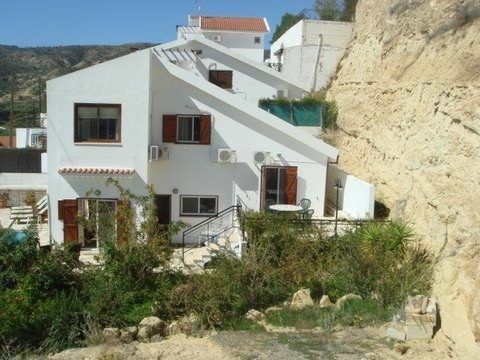 Superb location in Pissouri bay with a lovely elevated position. We had a fabulous two week stay. The villa is well equipped for a self catering family holiday (although several tavernas within close walking distance) Wonderful pool which was very welcome as temperatures soared to 38 degrees! The only thing I would mention is that the AC was not 100% efficient, but we did have some high temperatures to contend with! Thank you Angela for the use of your villa! This relaxing villa overlooking Pissouri Bay was great. It felt much larger than the pictures led us to believe. There is plenty of entertainment in the local area. Restaurants and sea and the sea are walking distance. The owner is friendly and receptive. Will recommend to friends and family in town! Die Bucht von Pissouri liegt an der Südküste Zyperns genau zwischen Paphos und Limassol (34 km). Es liegt in einem hübschen zypriotischen Weinbaugebiet. Pissouri, das größte Dorf der Gegend liegt auf einem Hügel und bietet einen ausgedehnten Blick auf das Land, das Meer und das Troodos-Gebirge in der Ferne.